Antique church pews are fabulous finds for the collector as well as for churches in the midst of remodeling or restoration. The Christian church has not always used church pews for seating. For the first 1,000 years of church history, people met in homes or used a format that was modeled after the Roman court in which people remained standing throughout the service. This allowed worshipers to move around and interact during worship time. In the 1300s, backless benches were pushed against walls or in a semi-circle formation in churches. Church services were still quite informal at this time. It wasn't until the Reformation in the 1400s that people became more concerned with not only the architecture of the church but also the décor. Pews were built to enhance the look of the building as well are force the congregation's attention to the focal point, the altar and the pulpit. By the 1600s, pews were used as a way to mark social ranking in some denominations. Those in the highest social circles sat in family pews near the pulpit while the lower classes sat in open pews further back. This practice fell out of favor by the 1930s when pews started to become open to anyone on a first come first serve basis. Churches that practiced this became known as free churches, or places where there were no private pews. If your church has acquired a vintage church with antique church pews or you have found one in an antique shop that is perfect for your hallway, chances are that it may need some restoration. In most cases it will at least need some loving care. If the pew is very ornate or very old, you may want to discuss your plans with an experience appraiser. Sometimes restoration can reduce the value of an antique. Here are some tips for bringing out the best in the piece. First, get rid of the grime. Using an oil-based soap like Murphy's Oil soap, some warm water and a soft cloth, wash the dirt gently off the wood. Take another look at the pew. The wood may look much better and you may want to stop at this point. Check for loose pieces, especially if there are carvings and embellishments on the pew. These can be secured with wood glue. If part of a carving is missing you may want to take it to a craftsman in the area who can repair it. If you feel you must refinish the piece then strip it with a wood stripper and refinish in the same tone as the original. If the wood is in very poor condition you may want to seal and paint it. There are several ways to use these beautiful antiques in your home.Decorating with antiques is a big part of the enjoyment of collecting them, so don't be afraid to use yours in whimsical, unique,and unusual ways. Pews make an excellent bench for an entry way, mudroom, or front porch. They are a great place to sit and remove boots or go through the mail. 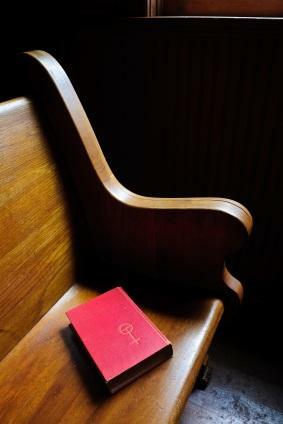 If you plan to use the pew on a porch be sure that you seal it with a good all-weather varnish to protect the wood. Use antique pews to create a nook area in your kitchen for eating. Nooks were very popular in the homes of the early 20th century, especially in bungalows and other Craftsman style homes. They were made up of high backed benches and a table, usually placed in a corner of the room. This created the feel of a room within a room. You can see a picture of one of these nooks at Arts and Crafts Homes. Using one or two high backed church pews may be the perfect way to get this look for your home. If you don't need the pew for seating but you love the shape of it, consider using it for a headboard. One woman cut out the center of the pew to fit the mattress in and used the edges for side tables. You can see the images of this unique bed at Shelter Pop. While a media room is a modern idea, you don't have to compromise your home's vintage look if you want to add a media room to your old house. Consider using a couple of pews with cushions as seating rather than the more modern seating usually available for media rooms. You can find some other ideas for using church pews in your home décor at Apartment Therapy. Church pews are by nature very sturdy. You really won't need to do much to them other than dust the wood regularly and give it a good polish with lemon oil about once a month. Check the bench regularly for signs of wear, scratches, or sun damage and make any necessary repairs as soon as you can. Church pews are a conversation piece in any home. They invoke memories as well as add character and charm.